Japan's Emperor Akihito is expected to abdicate on April 30, 2019, marking the nation's first succession from a living emperor in about 200 years, Prime Minister Shinzo Abe said Friday following a special panel meeting on key imperial issues. Abe said the 10-member Imperial House Council involving lawmakers, the judiciary and imperial family members decided on the octogenarian emperor's abdication date and succession to the throne by his elder son Crown Prince Naruhito on May 1, 2019. Abe's Cabinet is expected to formally approve on Dec. 8 a government ordinance setting the succession schedule. The emperor's abdication will end the current Heisei era in its 31st year. The government is expected to announce the name of the new era in mid-2018. The emperor, who has had heart surgery and undergone treatment for prostate cancer, said in a rare video message aired in August 2016 that he is concerned age would one day stop him from fulfilling his duties, understood as him expressing his wish to retire. Japan's parliament enacted a law in June to allow the emperor, who will be 84 on Dec. 23, to pass the Chrysanthemum throne on to his 57-year-old son. As the prime minister is required by law to hear opinions from the Imperial House Council before deciding on the abdication date, the panel met Friday to discuss the date. "Today, the Imperial House Council reached its decision without a hitch and I am deeply impressed that a big step has been made for imperial succession," Abe told reporters, vowing his utmost efforts to prepare a smooth succession. After his abdication, Emperor Akihito will be called "joko," a Japanese abbreviation of "daijo tenno" (retired sovereign), and Empress Michiko, 83, will be given the title of jokogo, with the crown prince ascending the throne and taking over the duties of the emperor. Crown Princess Masako will become empress upon her husband's succession. The Harvard-educated former diplomat has been receiving treatment for stress-induced illness for over a decade but has shown some signs of recovery recently by appearing in public more regularly, attending ceremonies and performing other duties. Prince Akishino, the younger son of Emperor Akihito, will become "koshi," or first in line to the throne, following the emperor's abdication. The Imperial House Council is a national deliberative body summoned to discuss important issues concerning the imperial family, such as the marriage of male family members and the loss of imperial status. It was last held in 1993 to approve the crown prince's marriage to Masako Owada. The panel is headed by the prime minister and its members include the heads of both chambers of parliament, the Supreme Court chief justice, the chief of the Imperial Household Agency and two imperial family members. Friday's meeting, which lasted for over an hour at the Imperial Household Agency's building in Tokyo, was the eighth council gathering, with the first held in 1947. The government initially leaned toward setting the date of the emperor's abdication in December 2018 and starting the new "gengo" (era name) used in the Japanese calendar at the start of 2019, according to government sources. An alternative option of setting the abdication on March 31, 2019, also ran into hurdles as the timing would overlap with unified local elections held once every four years. To avoid the busy political schedule and not to coincide with the start of a Japanese fiscal year on April 1, when many businesses transfer personnel, the April 30, 2019, date was preferred, Chief Cabinet Secretary Yoshihide Suga said at a press conference after the panel meeting. The panel decision also took into account that the emperor will have completed his 30-year reign by the planned abdication date, a day after the Showa Day national holiday on April 29, allowing people to reflect on the Showa era (1926-1989) under Emperor Akihito's father Hirohito, he added. Suga said the government plans to release the minutes of the panel discussion without specifying each participant's remarks. The government will set up an organization headed by Suga to prepare for ceremonies to mark the imperial succession. 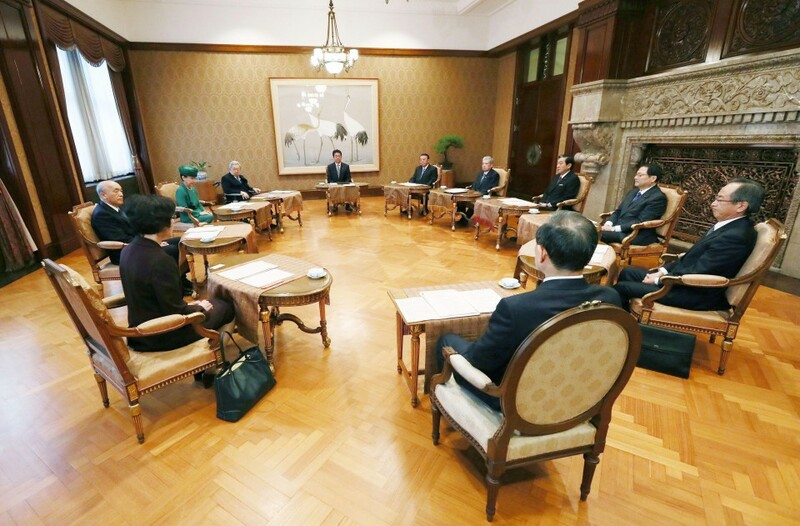 The Imperial Household Agency's Grand Steward Shinichiro Yamamoto said the prime minister presented April 30, 2019, as the only option for the abdication date to the panel meeting, and meeting participants agreed to it. The panel did not take a vote, according to Suga. Emperor Akihito ascended the throne soon after the death in January 1989 of Hirohito, posthumously known as Emperor Showa, becoming the first emperor to do so under the postwar Constitution. While on the throne, the emperor has often traveled with Empress Michiko to areas hit by natural disasters. Images of the informally dressed couple kneeling down to talk with survivors at evacuation centers were said to have helped bring the secluded imperial family closer to the public. The couple also traveled to former World War II battlefields overseas, as part of their efforts to pay tribute to those who lost their lives during the war, which Japan fought in the name of Emperor Hirohito. Before the enactment of the one-off abdication law, only posthumous succession had been allowed in Japan as the 1947 Imperial House Law lacks a provision on abdication. The last monarch who abdicated was Emperor Kokaku in 1817. 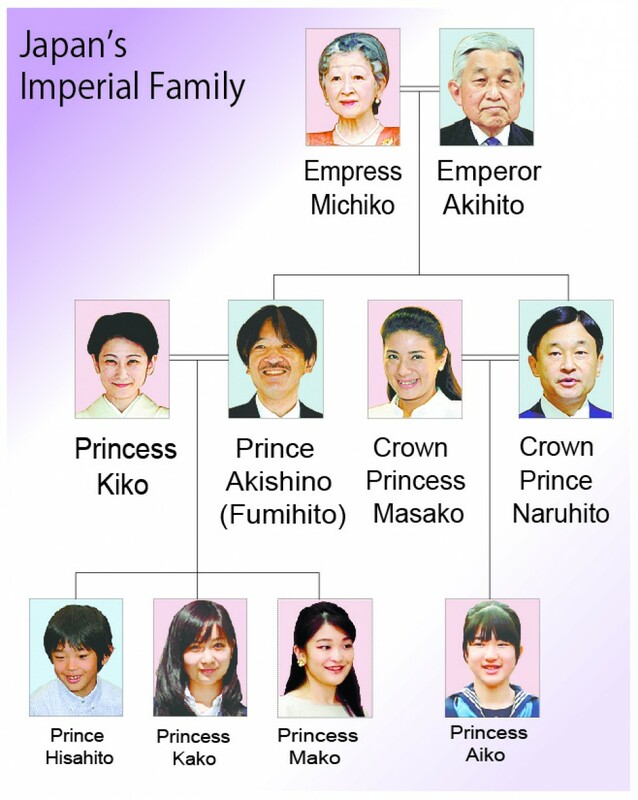 Emperor Akihito is supposedly the 125th emperor of a hereditary lineage believed to stretch back more than 2,600 years, if legendary ones are included.